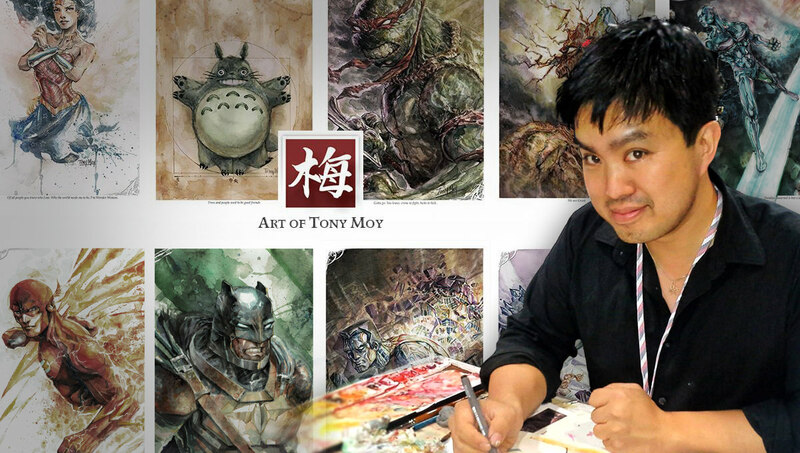 Tony Moy is creating watercolor and comic art. Thank you for all of your support. Thank you for joining my live streams on Twitch, for following me on Instagram, watching my videos on YouTube, retweeting my tweets, visiting me at a convention or just liking my art somewhere. It's means a lot and in many ways, keeps me moving forward. I'm excited to create new original art & comics for all of you and to share my process by providing the initial sketches & process work, live streaming and making new videos for you. I have so many ideas to share with you -- new traditional & web comic projects, watercolor tutorial videos, original concept paintings, more frequent live streams and more! I hope to share each step on this crazy new journey with all of you who make this possible. I'll be keeping this Patreon simple to start off, but will be adding more tiers and goals as we mature and as they make sense to. So I'll leave it to you to determine the magnitude of your support. I will however set some fun goals involving creating custom pieces that the community requests. As we hit these key goals, I will provide Patreon exclusive access to purchase custom postcards, prints and merchandise of the art created here. But if you have any suggestions on rewards and tiers, please let me know. To me, this is as much about all of you as it is about me; and in that spirit, all of our goals are Patron based. I look forward to sharing this new path in my journey with you. I am a watercolorist and published comic book artist living in Chicago. I currently am an adjunct instructor at the School of the Art Institute. I enjoy my tea with lemon, my paper hot pressed, and my pies with apple. Up until now, like many striving creatives, my creative life existed in the cracks and crevices of my "professional" life. By day, I worked in technology and taught classes, by night, I escaped into my art. If I couldn't find the time, I would make it and for the past few years, I would wake up at the crack of dawn, red bull it late into the night, and sacrifice weekends and vacation days to make the space and time outside my expected 9-to-5 grind. And all of you? You all kept me going. Without all of your support, I truly would not be here ready to take this next step in my artistic journey: creating art as a full time endeavor. I began my watercolor journey in 2012, and it is my medium of choice. I attend a variety of comic conventions around the United States such as DragonCon, Rose City Comic Con, Baltimore Comic Con, New York Comic Con, C2E2, Emerald City and more! I'm also excited to be a part of the MCM Comic Con in London this October 2018. My artwork has been published in comics such as The Mainstream (Zenescope), X-files (IDW), Memory Collectors, Dungeons & Dragons and others. Access to behind the scenes art process and more with access to a Patreon supporters only Discord. 15% Patreon only store discount to purchase all the prints and merchandise you might want. Access to purchase exclusive Patreon created art & prints. Phone backgrounds of original art formatted just for your favorite mobile device. Have cool art with you at all times! -OR- create your own custom pledges and receive all the same benefits as this tier and my undying appreciation. The community will select a theme (SciFi, Fantasy, SteamPunk, etc) for me to paint(7"x10"). We will stream the process, share the sketches make videos and all that fun stuff. The artwork will be made into exclusive prints, and only available for purchase to patrons.